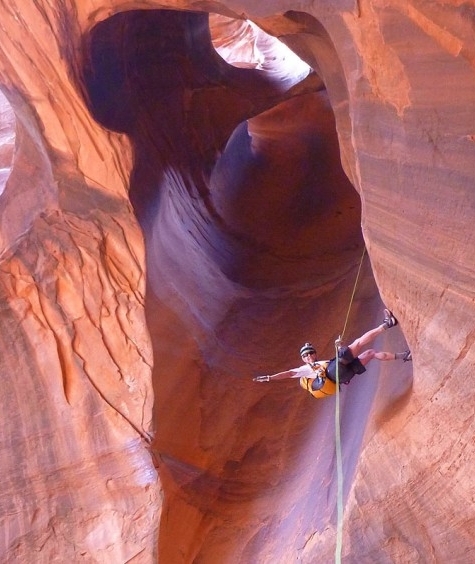 CUSA started as a website for canyoneering beta called “Tom’s Utah Canyoneering Guide." I’d go out in the desert, do a canyon (often from Steve Allen’s book), make a map, write it up with pictures and post it. From today’s perspective, that seems really naïve; some of those write-ups are still on this site! I see now that posting did what I hoped it would do, which is start conversations with people, and find people to go do canyons with. It evolved. The Yahoo Canyons Group got started. We had Rendezvouses and Festivals. More people joined us. Soon we had a community. I began rock climbing in 1974 and did a lot of that, eventually working for Black Diamond as a product designer of technical sewn products (harnesses, harnesses, harnesses, plus packs, gaiters, webbing products, etc.) We moved the whole company to Salt Lake City in 1991, and a few years later I discovered the DESERT. I survived my first couple of technical outings, more by luck than anything else! I was enthusiastic, but lacked steady partners. Brian Cabe took me under his wing, which helped a lot, but my appetite for canyons was larger than his. This was 1999 and the Internet was just getting going, so I started a website and posted up what I was doing. Eventually other partners showed up, we built a community and entered the silver-age of Internet-assisted canyoneering. I make stuff. As in, design and sew things up. I’ve done this for 35 years. I’m a professional! 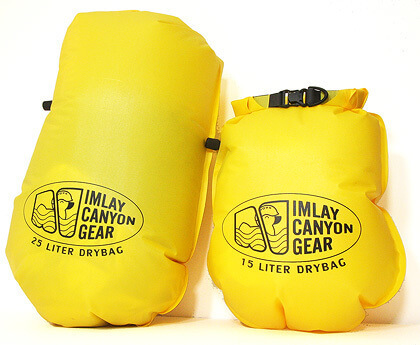 Thus, when I started canyoneering, I also started making canyon-specific items like canyoneering backpacks and ropebags under the name Imlay Canyon Gear. Scott Holley financed purchasing some Black Diamond DM probe pole sections for making Happy Hookers, so we made a few of those. Then Scott ponied up for some Cordura and Mesh, so we could make a few rope bags. I refined the canyoneering pack, working through several versions that the aficionado can see are closely related to a certain generation of Black Diamond packs. A few years later, Black Diamond and I parted ways. I worked harder on the Imlay stuff, and tried selling photographic prints at Art Fairs. The Imlay stuff started doing better, the photo prints not so much. After three years, Imlay started doing well enough that it could actually pay me, which was good, because I was up to the neck in credit card debt (remember easy credit?). Just in time, the canyoneering community got big enough for me to make a living selling gear. A big thank you to all who assisted in this endeavor. I had two years of true unemployment in there, when I thought I could not justify getting out and doing canyons. As a result, part of my new job description as “Chief Cook and Bottle Washer” at Imlay Canyon Gear is to GET OUT at least 80 days a year. I’ve been running a little higher than this of late, thanks to super-enthusiastic canyoneering machine, Steve Ramras. And it has been good. Getting out a lot and living in Salt Lake City resulted in many crazy late-night drives. I remember driving past the time sign in Draper one night as it turned to midnight – with a 5-hour drive ahead. Something had to change! April 2006 I moved down to quiet and peaceful Mount Carmel, Utah, just east of Zion National Park. My new location allowed me to finish the Zion: Canyoneering guidebook that fall; the next spring, I became a canyoneering guide with the fine people at Zion Adventure Company in Springdale. Guiding brought a whole new arena of challenges to my life, it being all about people and communication. Guiding is an amazing complement to running an internet-based business that involves almost zero actual interaction with human beings. And ZAC is a warm, supportive, engaging, energetic workplace with great people doing great things. Business has grown gradually, better gear has been brought to market, new dealers have been opened, new canyons explored, new friends developed. Canyoneering has been very, very good to me. Canyoneers occasionally send us notes and letters letting us know how our products are working "out there." Whether you write with critique, praise, or tales of gripping adventure, we love reading what you have to say. And since nobody speaks as frankly about CUSA goods and services than our clients, we'd like to share a few endorsements that suggest we might just be doing some good in this world.